I discovered the hard way that moqueca—the coconut-based Brazilian fish stew—is a dish that’s meant for sharing. After our first few days in Rio last winter, Charlie and I decided to escape the beaches full of Amazonian floral thongs and speedos, in favor of a beach with more chill, less touristy vibes (albeit, the same swimwear). When we arrived at our eco hotel on the large, aptly named island of Ilha Grande, we were pleasantly surprised to find that we’d be sharing the grounds with just a few other couples. And we were even more surprised that we were the only Americans on the premises. Usually the only times I’ve found myself as the lone American in a tourist oasis is when I’ve rented an AirBNB by myself. Needless to say, we were incredibly proud of our research prowess for managing to find somewhere “authentic” where only Brazilian “locals” knew to go. That is the travel dream, yes? Well, let’s just say we were quickly reminded how spoiled we are to live in a country who considers their language the mother tongue of the world. At meals, the others would be exuberantly talking over one another in Portuguese—discussing, I imagine, the latest political scandal, hot new restaurants in Rio, and where they had each bought their fetching thong bikinis. Meanwhile, Charlie and I would be smiling and nodding at each other across the table, and trying not to seem too eager and grateful when one of the better English speakers would take pity on us and attempt to translate. We felt this outsider pressure even more on New Year’s Day, when the hotel organized a boat excursion to a restaurant on the other side of the island. Charlie and I had yet to try a real deal moqueca, and despite my worry that it was a touristy order, I went for it. The Brazilian nationals, meanwhile, ordered a few pasteis to share (if you don’t know what those are, see here for your cuisine cheat sheet). And as they passed around their modest plates of small bites, the server arrived with a large black bubbling cauldron of seafood, and set it in front of me. It’s always easier to presume someone is judging you when they’re speaking another language, and I took each giggle and sigh from my seatmates to mean: ah, you sweet chubby Americans. As Charlie and I tried to pass around the 8-quart wizarding pot and pawn off some of the fish on the others, we at least got a schooling in the correct way to eat a moqueca: with lots of rice and farofa to soak up the crimson sauce, a generous spoonful of “pirao,” and (obviously), plenty of people to share it with you. Our default translator explained that pirao is made from simmering the fish broth down to a concentrate and then adding yuca flour to thicken it further. It’s a similar concept to a French rouille, which takes a little bit of the stock from the bouillabaisse it accompanies, and whisks it together with mayo to create a creamy topping. 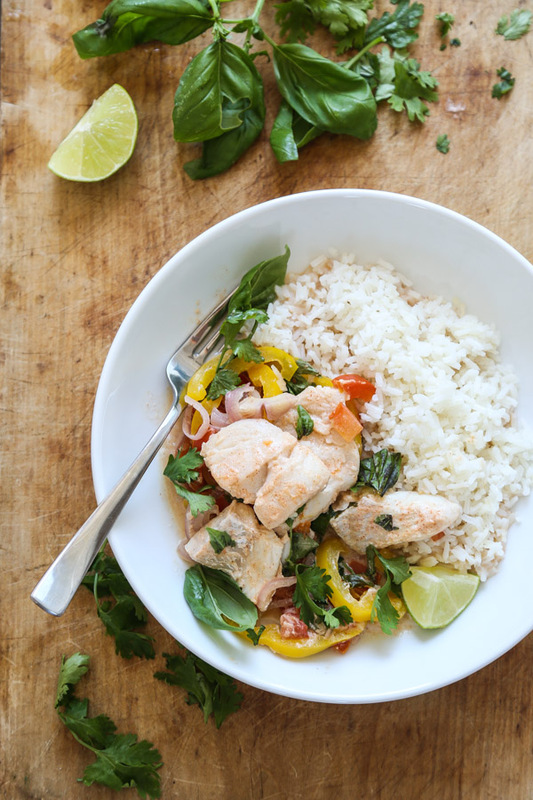 It’s the prized part of the moqueca that adds even more flavor and bulk. When I got home, I was desperate to recreate the flavors of that moqueca. It had all the funky, fishy depth of a bouillabaisse, but also the cooling richness of the coconut milk and brightness of fresh cilantro. Even though I could have easily scaled down the stew to a less cauldron-worthy quantity, our idiots abroad experience left me wanting to recreate the dish in more manageable single servings. 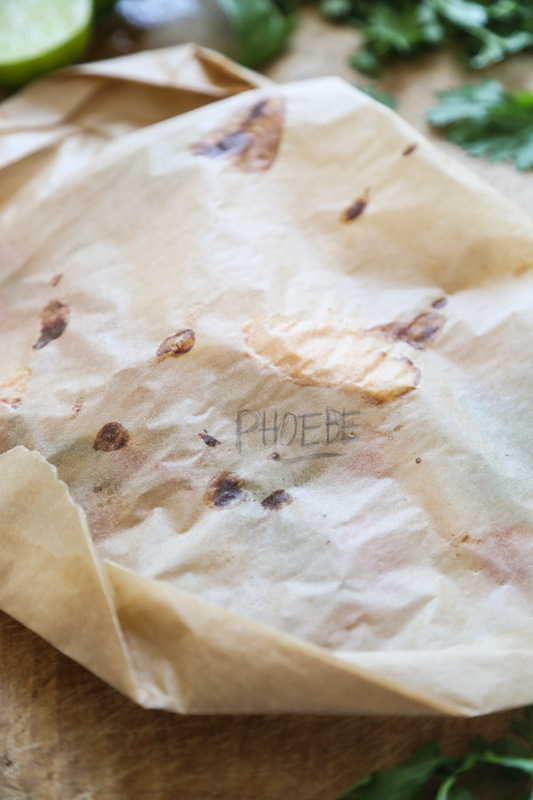 So that’s how I arrived that these semi-authentic moqueca-style parchment paper packets. This technique is one of my favorites for a quick weeknight meal. What you lose in flavor by not simmering the broth for hours, you gain in time not spent slaving over a hot stove in the summer heat. And after eating true moqueca in similar conditions, I can say that for this time of year, I much prefer the lighter version sans cauldron. This moqueca recipe uses paprika instead of the more traditional palm oil to get that saffron color, and it’s the perfect time to take advantage of fresh tomatoes and peppers for the sauce. If you want to switch up the add-ins, make sure to select veggies that cook rather quickly (zucchini and summer squash work well!). I used shallots instead of onions for that reason. The fish will only take 10 minutes to steam in the packets, so you’ll want whatever else is in there to easily soften in that amount of time. This is also a fun activity for a dinner party. Allow everyone to make their own packet and write their name in pencil on the top (as I did with mine above). After all, a moqueca is meant to be shared. But if someone else’s eyes are bigger than their stomach, and least it’s not your speedo-ready bod that has to suffer. 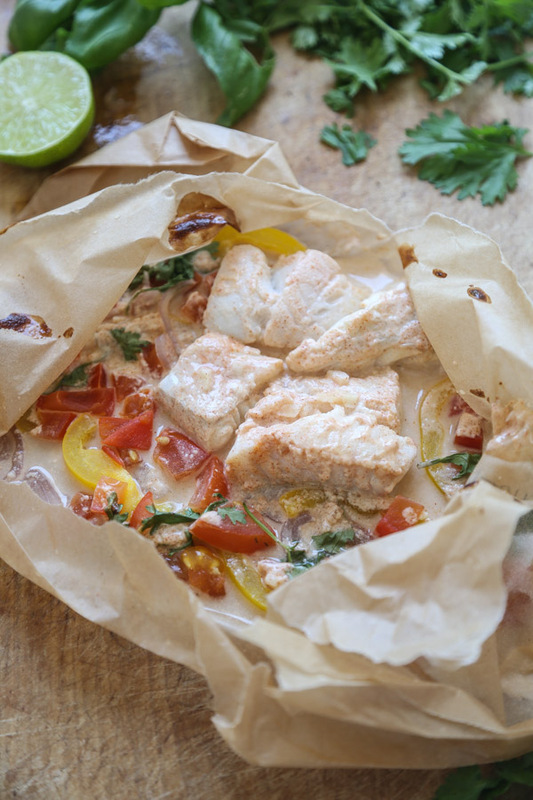 I’ve made these packets with all different types of fish, so use this recipe as an excuse to take your summer seafood challenge up a notch and try out some new species you’ve never cooked before! And stay tuned for a whole month dedicated to sustainable sea creatures, and perhaps a few more Brazilian delicacies along the way. 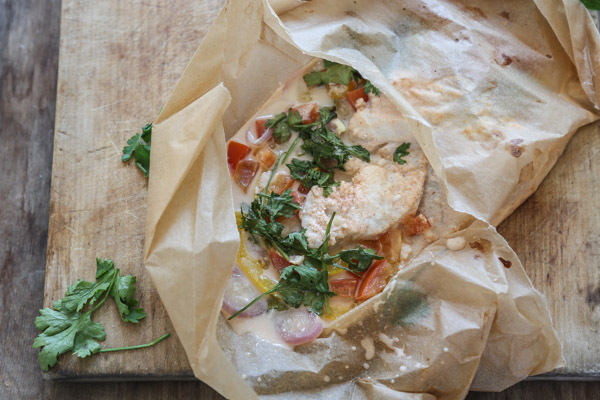 This quick cooking version of a classic Brazilian fish stew with coconut milk happens entirely in a parchment packet. 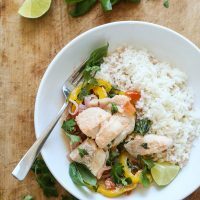 This moqueca recipe is super easy and healthy, and perfect to make with a variety of different fish. 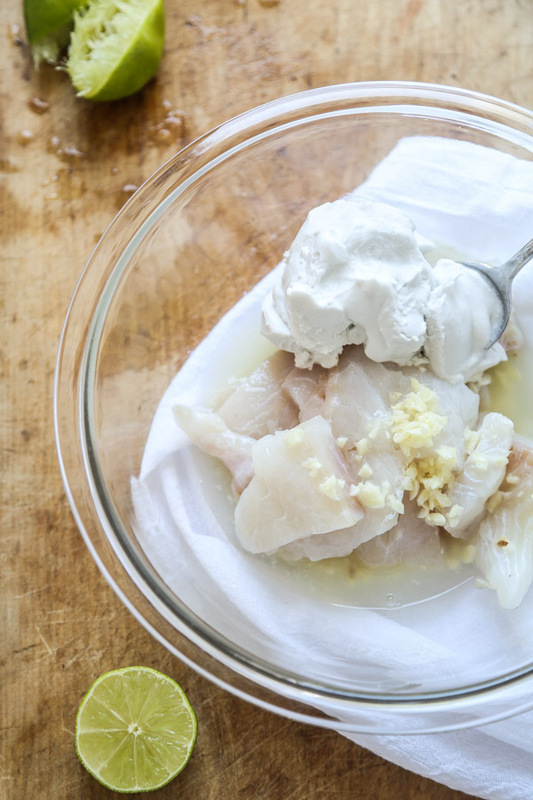 In a large mixing bowl, toss the fish with the garlic, lime juice, coconut cream, 1/2 teaspoon sea salt and paprika. Marinate the fish while you prep the remaining ingredients. 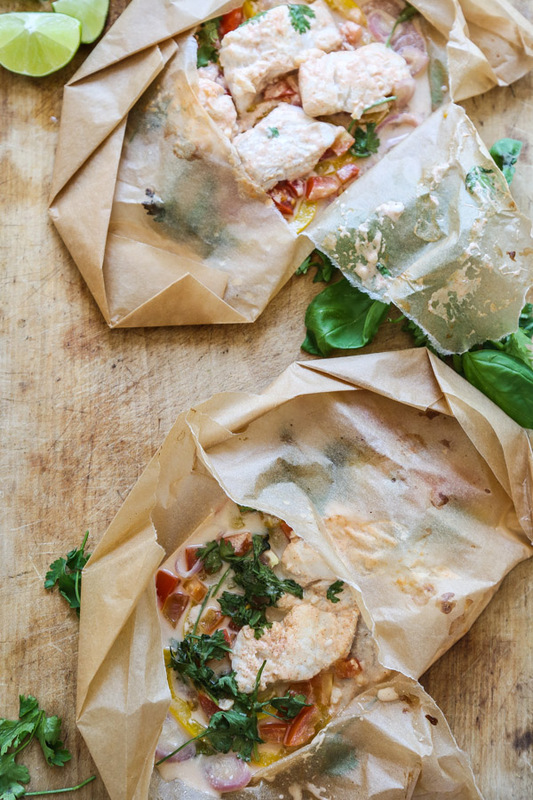 Place a few pieces of fish on one side of each of the sheets (you can make them one by one if you’re tight on space). 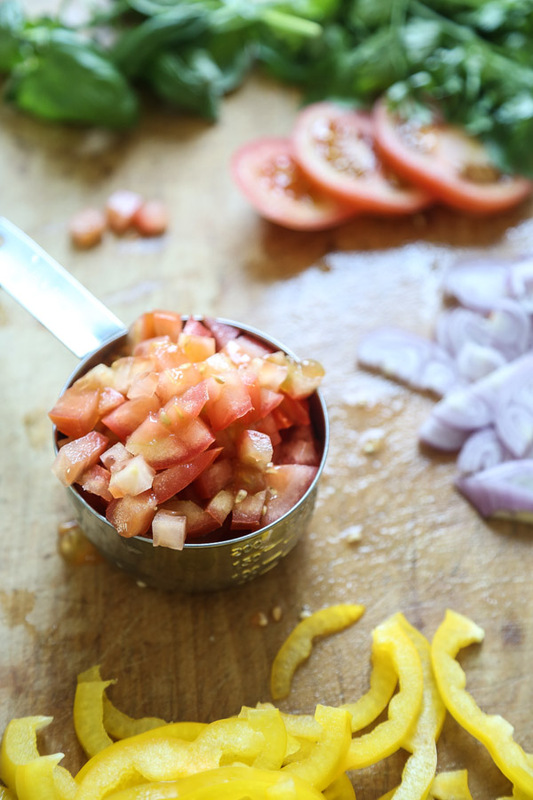 Scatter the shallots, tomatoes, and peppers around the fish, being careful not to cover it, leaving at least an inch of space around the edges of the packet. (The veggies will need contact with the surface area of the baking sheet in order to cook properly, so scatter as evenly as possible). Season the veggies lightly with salt. 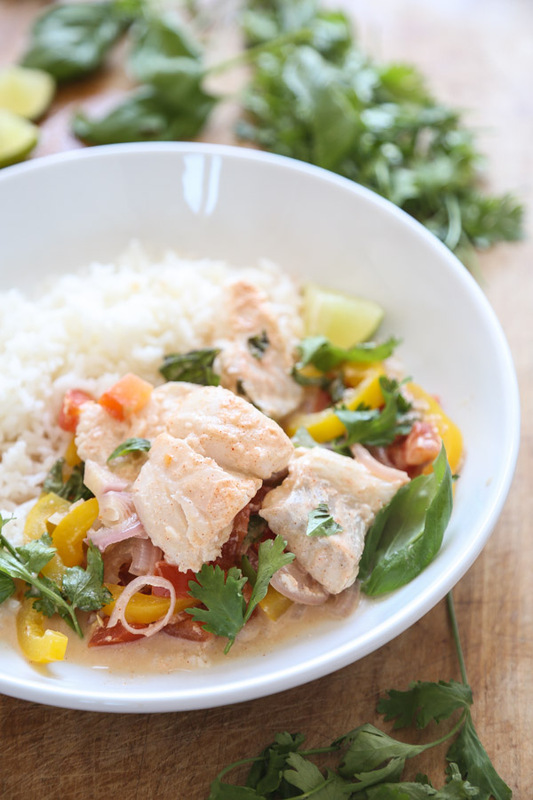 Ladle the remaining coconut cream mixture over the veggies and garnish with a generous tablespoon of cilantro. Fold the parchment over the fish and fold the edges from one side to the other, making sure the lines are clean so that no air escapes. The end result will look like a tightly sealed empanada origami. Bake in the oven for 10 minutes, or until the packets are puffed and a toothpick inserted through the top slides easily into the fish. Allow to cool for a minute before opening, then serve immediately directly in the packets or spooned over rice or quinoa, with additional cilantro, basil leaves and lime wedges for garnish. 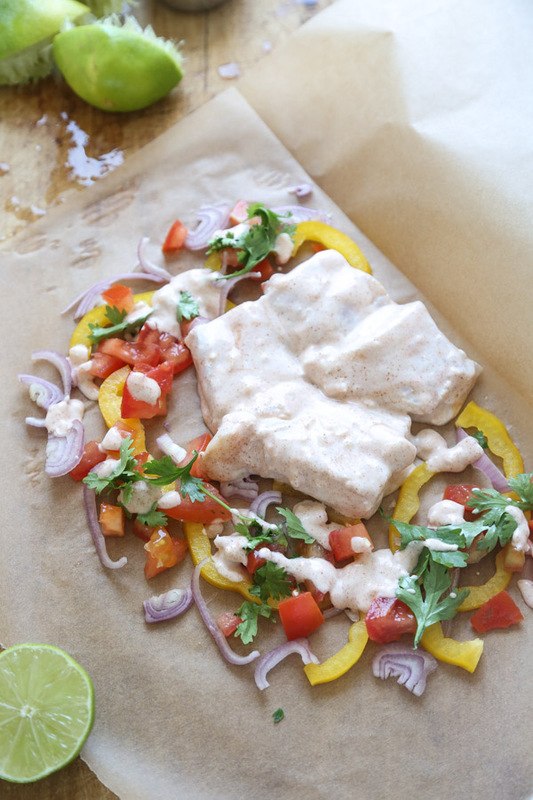 Don’t let the fish marinate for more than 15 minutes otherwise it will turn into a ceviche! Second, since this is an American blog, we re dealing with ingredients we can get here. True Bahian moqueca is made with a fish caught off the coast of northern Brazil. In our case, we ll want to use a firm white fish. I used cod for this batch, which is barely firm enough. Halibut would hold up better. Very true. 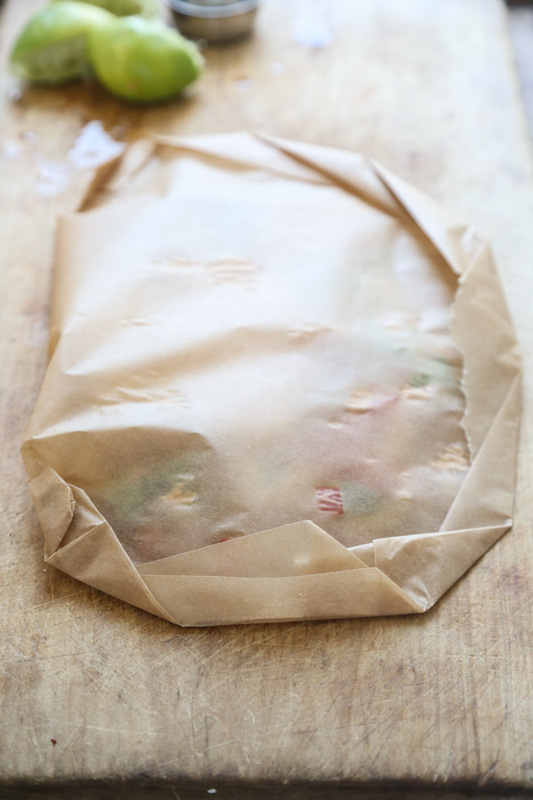 For the packets though, you can use something that’s a little flakier and less sturdy. For real deal Moqueca in a pot, definitely choose something that’s firmer.